FOXBOROUGH, Mass. (AP) -- Ryan Fitzpatrick threw into the end zone to the open man. Unfortunately for the Bills, that man was Patriots safety Devin McCourty. FOXBOROUGH, Mass. (AP) — Ryan Fitzpatrick threw into the end zone to the open man. Unfortunately for the Bills, that man was Patriots safety Devin McCourty. That easy interception with 23 seconds left decided the game the way every other Buffalo game at Gillette Stadium has ended — with a New England victory. On a day of dreadful defense by both teams, the Patriots held on for a 37-31 win over the surprisingly tough Bills on Sunday despite allowing 35 first downs, Buffalo’s most ever and the most ever allowed by New England. The Patriots (6-3) let a 17-3 lead slip to 34-31 with 7:47 left on Fitzpatrick’s 2-yard pass to Donald Jones. Then the Bills (3-6) held the Patriots to a 27-yard field goal by Stephen Gostkowski. Avoiding the penalties, 14 of them, that had stymied them all game, the Bills moved to the Patriots 15-yard line before Fitzpatrick threw the ball right into the hands of McCourty while trying to hit T.J. Graham. Tom Brady then knelt down for the final play. New England is 11-0 against the Bills at Gillette since it opened in 2002 and 23-2 overall in its last 25 games against Buffalo. The Patriots were coming off a bye that followed their best game of the season, a 45-7 win over the St. Louis Rams in London. The Bills have lost five of six and need a sharp turnaround to avoid their 13th straight non-playoff season. Fitzpatrick completed 27 of 40 passes for 337 yards, the second time this season he’s thrown for more than 239. The other came when he had 350 in a 52-28 loss to the Patriots. He also threw for two touchdowns Sunday, but his only interception ruined the Bills’ upset chances. Brady was 23 for 38 for 237. His last incompletion, a ball thrown into the ground about 5 yards in front of the intended receiver, set the stage for Buffalo’s final drive. Brady watched McCourty’s interception from the sideline. The game was closer than expected considering the Patriots led the NFL in points and yards gained and the Bills were next to last in points and yards allowed. The Patriots extended their streak to 11 straight scoring possessions against the Bills with a field goal and three touchdowns on their first four series Sunday. In the previous meeting, New England scored on its last seven series: six touchdowns followed by a field goal. But not even that could give the Patriots a secure lead and they entered the fourth quarter ahead 31-24. The Patriots led 24-17 at halftime, scoring on a 43-yard field goal by Gostkowski, touchdown runs of 1 yard by Stevan Ridley and 15 yards by Danny Woodhead, and a 2-yard pass from Brady to Rob Gronkowski, his fifth touchdown catch in three games. The Bills scored on a 42-yard field goal by Rian Lindell, a 14-yard run by Fred Jackson and a 3-yard pass from Fitzpatrick to Scott Chandler with 31 seconds left in the half. 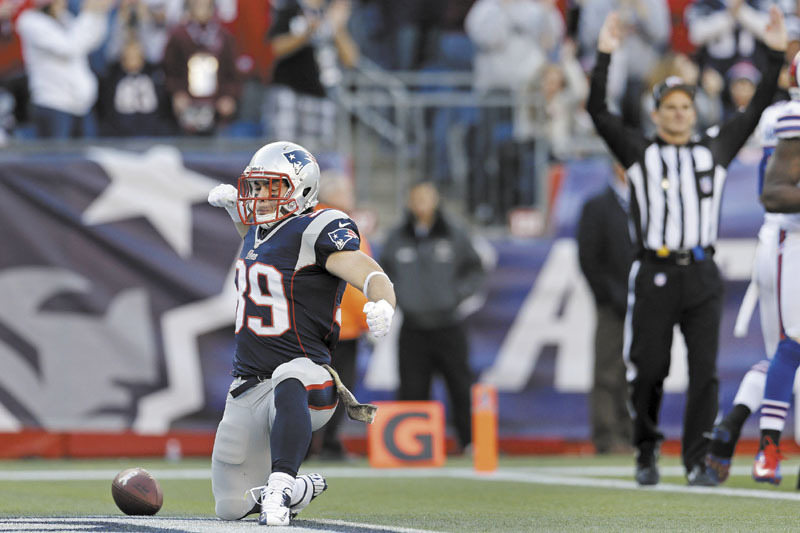 Woodhead scored again, his first multi-touchdown game of his career, on an 18-yard pass from Brady. But the Bills cut the lead to 31-24 on the next possession on a 1-yard run by Jackson and Lindell’s extra point. Gostkowski’s 48-yard field goal gave the Patriots a 34-24 lead 50 seconds into the fourth quarter. On their final drive, the Bills were forced to take an injury timeout when Jackson was hit in the head area by linebacker Brandon Spikes. Earlier, Spikes was called for roughing the passer when Fitzpatrick’s helmet fell off, and Fitzpatrick yelled at him. Playing in Foxborough can’t be very high either, although the Bills were one errant pass away from a chance to win. Not even a win over a struggling team that had lost every game it played at Gillette. NOTES: Running back Kevin Faulk, who recently announced his retirement after not playing this season, was honored by the Patriots at a halftime ceremony. … Wes Welker had six receptions, extending his streak to 103 games with at least one. … Fitzpatrick became the fifth quarterback in Bills history with at least 10,000 yards passing.